Bowl eligible. Those two words say an awfully lot, especially if you are an Illinois football fan. Given the last few seasons in Champaign-Urbana, there hasn't been a whole lot to cheer for during the fall months. However, this season, Ron Zook's third at Illinois, things are much different and there is actually an air of excitement around campus and the state. On Saturday, the Illini reached the magical 6 win plateau with a somewhat convincing 28-17 victory over the Ball State Cardinals, a team from the Mid-American Conference. Rashard Mendenhall returned to his old form, rushing the football 28 times for 189 yards and 2 touchdowns. But it wasn't just Mendenhall who gave the Cardinals problems on the ground. Quarterback Juice Williams missed the 100 yard mark by 1 yard, rushing for 99 on 17 carries and a couple of scores himself. With the performance, Williams went over the 1000 yard plateau for rushing in his career at Illinois. However, the elusive sixth win wasn't as easy as it might have seemed. The Illini kept Ball State's signal caller Nate Davis in check, which was one of the reasons why they won the game. At Zook's weekly gathering with the media on Tuesday, he stated that just because they have six wins, that doesn't guarantee them a bowl. It just makes them bowl eligible at this point, and he stressed that they still have a lot left to play for, and each win from this point forward puts the Illini in position for a better bowl. That journey begins this Saturday, when the Illini travel to Minnesota to play the Golden Gophers (7:00 pm central time, Big Ten Network), a place that Illinois never seems to play well in. Minnesota is in the process of having a new stadium built, and it will be ready in time for the 2009 season. The Golden Gophers are coached by Tim Brewster, who played his collegiate football at Illinois. Last year, Brewster's son, Clint, verballed to Zook, but when his father took the job at Minnesota, he opted out and joined him in Minneapolis. Brewster's style of coaching is rather aggressive, and on more than one occasion, he has tried to win a game at the end, only to have it backfire and instead, hang a loss on the Gophers. Michigan defeated Minnesota 34-10 last Saturday in Ann Arbor, and the Gophers come into this game at 1-8 overall and 0-5 in the Big Ten. Zook likens the struggles that Minnesota is going through to what he had experienced his first year at the helm of the Illini. He says that they are getting better, and whereas they play a lot of young guys, those players will get more experience and keep getting better year after year. Hmmmm, that sounds very familiar, doesn't it? Even though football season is still going strong, basketball season also begins this week, as Bruce Weber's squad takes to the court for its first exhibition game of the season against Quincy College on Wednesday at the Assembly Hall. (8:00 pm, central time, Big Ten Network). Illinois, who will be a younger team this season, only have 2 seniors on the team, Brian Randle and Shaun Pruitt. At the Orange and Blue Scrimmage on Sunday afternoon, it was time for Weber to see what the players have accomplished thus far in practice. Judging from what I witnessed, the Illini are going to have to find a way to get the ball in the basket. They have a lot of scorers on the team, but those guys are going to have to find their range and make it happen on the court. Guys like Trent Meacham, Steve Holdren, and Demetri McCamey will need to step it up. Weber talked about how it is nice to finally be able to play against someone other than themselves, and also a chance to have some of the young players make a bid for playing time. There is also the business of redshirting, and decisions regarding who should, versus who should not, will need to be made during these games as well. Weber has hinted at Brian Carlwell possibly doing just that, because he still isn't all the way back from his near fatal accident last February. Weber stressed to Carlwell that he needs to be able to u se him, and if he cannot, then sitting out a year is an option. Stay tuned. I'm also excited about women's basketball starting up this season. New Illini women's bench boss Jolette Law has given new energy to a stagnant program, and her enthusiasm for success is much needed. Not that her predecessor didn't have that vision, but the program streamlined the last few years, and if Law's bark is as good as her bite, then the Illini will once again be dancing come March. The Assembly Hall needs to be a place to be reckoned with for the women, as well as the men, and I think Jolette Law is the person that can take them there. Are the Illini men poised for another NCAA Tournament run? Will the women finally get back to the dance? I welcome any comments about anything Illini, so please let me know what you think. This is my favorite time of the year. The time when the sports seasons overlap and you literally have something going on every night. With meaningful football still being played into October and the start of basketball season just around the corner, things are beginning to pick up on campus. The first question of the day would have to be what has happened to the football team? After the early loss to Missouri, the Illini reeled off 5 straight wins and it was looking like a New Year's Day bowl game was in the offing. Well, that's where the problem begins. Looking ahead like that and not paying attention to the bumps that lie ahead on the road (Iowa, Michigan) can sometimes come back to haunt you. This past weekend, the Illini and Wolverines did battle in the national spotlight, and if you can coin the phrase "beating yourself", then that would apply to the Illini on this given night. It looked very good early on for Illinois, as they got in the endzone early against Michigan. The Illini actually led 14-3 before the Wolverines began to chip away. But just like a dollar bill, you need four quarters to make a dollar, and the Illini have been having trouble sustaining their momentum the entire game. It seems that whatever is going well in the first half is abandoned in the second, and more often than not, it is difficult to win games when this occurs. Rashard Mendenhall carried the ball 18 times for 85 yards, but did not find paydirt this weekend, the second such week that he has not scored. What may be more puzzling is the quarterback situation, although Ron Zook does not think he has a quarterback controversy. Juice Williams only completed 8 of 14 passes for just 76 yards with a touchdown pass to Jacob Willis, but also was picked off once. Backup signal caller Eddie McGee also saw action, but didn't exactly light it up either, completing 6 of his 12 passes for just 46 yards. So, the question that begs asking is this: would it make a difference if McGee started in place of Williams? I'm not sure the answer to this, but McGee has a way of moving the Illini down the field that Juice does not. Perhaps we will get to find out this weekend, when the Illini step out of conference to host the Ball State Cardinals for Homecoming at Memorial Stadium (11:00 am, CT, Big Ten Network). One thing is for certain coming into this game; the best quarterback on the field will probably be wearing red. According to Zook, Cardinal quarterback Nate Davis is probably one of the best all-around players in the midwest, and if the Illini aren't careful, he could torch them. Yes, the Illini are in a bit of a rut right now, but Zook like the attitude of the players after another tough loss. In his weekly address to the media contingent, he said that the team was down, but ready to bounce back in front of the alumni. Plus, Zook went on to add that the Illini still have a lot to play for, and at 5-3 overall and 3-2 in the Big Ten, are still only 1 win away from being bowl eligible. Regardless of what happens, the Illini will be okay in the end. The talent is there; they just need to play to their potential and quit beating themselves. Fans looking for an alternative to parking congestion and construction woes can breathe s collective sigh of relief. The Division of Intercollegiate Athletics has a program that they have been doing all season that can alleviate some of this. For $1, fans can park their vehicles at the parking garage at the corner of University and Goodwin Avenues and board an MTD shuttle that will take them to the stadium (don't worry, it will take you back to the garage after the game, as well). According to Kent Brown, the service has been a success, but would like to see even more people take advantage of it. It seems hard to believe, but basketball season is almost upon us. This Sunday marks the annual Orange and Blue Scrimmage, which signals the official start of the season. The Illini will be a veteran team, but with only 2 seniors on the roster, still have a lot of youth. Shaun Pruitt and Brian Randle are the lone seniors, and will be expected to take on the leadership role with junior Chester Frazier, a task that all three say they are ready to undertake. If there's one thing that Bruce Weber has this year that he lacked last season, it is the abundance of bodies available on the court. Several redshirt candidates loom, including freshmen Mike Tisdale, Bill Cole and Mike Davis. Players never want to hear the "r" word, because they all come to college to play basketball and not sit out. But for some, redshirting is more needed than you think. Just think if Warren Carter would have taken his. He'd be back this season, ready to lead the Illini into battle. Some players are just not physically ready for the rigors of the Big Ten, and need a year to get stronger and more physically fit. Oh yeah, then there's that Jordan kid. Probably the most hyped walk-on at Illinois in some time, Jeff Jordan has looked pretty good in practice, and may actually see some playing time. His famous father, Michael, was on campus last week filming a segment for "The Today Show", and rumor has it that he is in the market for a house in west Champaign. But all of this aside, Weber has taken plenty of heat regarding recruiting and missing out on the big names, but even that tide seems to be turning. Weber will have a lot of decisions to make in the next couple of weeks, because the exhibition season begins next Wednesday at home against Quincy University. Good times indeed. It's back to the drawing board. Just when you thought that the Illini football team had it going, to be specific, consecutive wins over top 25 teams for the first time in ages, a modest five-game winning streak, and momentum heading into a hornet's nest known as Iowa City, the Illini stubbed their toe and dropped a 10-6 decision to the Iowa Hawkeyes last Saturday at Kinnick Stadium. What was most discouraging about this loss was not the fact that it happened, but how it happened. First of all, Iowa had come into the contest at 2-4, and was winless in the Big Ten so far in 2007. Secondly, the Illini had not beaten the Hawkeyes in several years, and all signs pointed to that streak coming to an end. Coach Ron Zook had eluded to that very fact the week before, and warned of Iowa being a very good team that should not be overlooked. As a whole, the Illini didn't play that bad of a game, it was the mental mistakes that spelled defeat for them on this day, both by the players and the coaching staff. The Illini were held out of the endzone the entire game, but actually did score a touchdown, only to have the play called back because of a penalty. The play was a thing of beauty, with reserve quarterback Eddie McGee throwing an 83-yard spiral to Joe Morgan in the fourth quarter. Well, when plays of this nature are conducted, you always fear the worst, that elusive penalty flag. This incident was no exception, as tight end Michael Hoomanawanui was called for being an ineligible receiver downfield. In all actuality, it was the receiver lined up to the left side that had caused the "Hooman" to be lined up illegally. The Illini never really recovered from there, but that wasn't the only questionable call on the day. Earlier in the contest, the Hawkeyes were faced with third down situations not once, but twice, and penalties on each play by the Hawkeyes prompted Zook to take the penalties and force Iowa to run another play instead of setting up fourth down. Well, to make a long story short, Iowa capitalized on one of those plays for a touchdown, and sent the Illini down to defeat. It just goes to show you that sometimes you are second guessed and the results can be devastating. 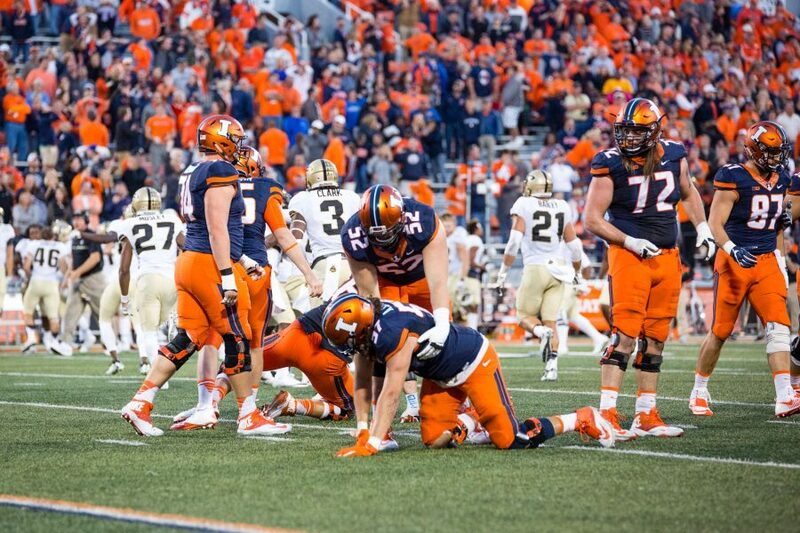 In a week that saw the Illini's first Top 25 ranking in nearly seven years and a chance to become bowl eligible before November hit, all that has been temporarily placed on hold. Is the news all bad? Not at all. The Illini are still 5-2 overall and 3-1 in the conference, they are still near the top of the conference standings, and they have a huge game this Saturday against Michigan (7:00 pm CST, ABC). The Wolverines have righted the ship that temporarily sunk on opening day when they were upset by Appalachian State, and they bring in a 5-2 overall mark, but are unblemished so far in league play at 3-0. This game will mark the first time in recent memory that the Illini have been given the prime time slot on ABC, which will be a national broadcast. This also means that every Illini fan will get a chance to see the game, since it will not be on the Big Ten Network. The game is a sellout, and Zook expects that the crowd will be more than fired up by the time the opening kickoff ensues. Preparing for Michigan this week will ne tough, because they may be without their star tailback Mike Hart, who was injured a week ago. Quarterback Chad Henne will start however, and it will be time for the Illini defense to step it up another notch. Is there a quarterback controversy brewing at Illinois? According to Zook, there is not. Juice Williams continues to be his guy, although he did say that McGee would probably see some action, although he didn't speculate when this would occur. He has also hinted that he has considered using Juice and Eddie in the same offensive set, but didn't elaborate on the idea from that point on. Whatever you want to make of it, this will be a huge game for both schools, and an electric atmosphere is expected under the lights at Memorial Stadium on Saturday night. It should be a good one. coup of juniors, Weber added another one early this week with the announcement that Stan Simpson from Simeon High School will be wearing Orange and Blue next season. The basketball season officially began on Friday night with the annual "Illini Madness" event, this year taking on a different scene, as the Assembly Hall was painted pink for breast cancer awareness, a cause near and dear to Weber's heart. To date, over 20,000 of the pink shirts have been sold, letting the nation be aware that the University of Illinois is setting the standard in the Coaches vs. Cancer debate. The madness event itself was rather disappointing, since there was not much basketball played that evening. There were different groups that performed dance routines, clearly for entertainment purposes only. I'm not really sure if that actually fit into a event like this, but it was entitled "Illini Madness" after all, so I guess anything was possible. Before the Illini scrimmaged, Coach Jolette Law addressed the crowd and displayed her enthusiasm for being at the University of Illinois. Coach Law played her collegiate basketball at Iowa, but now says that she "bleeds orange and blue". She has a dynamic personality and a high level of excitement, and if she can back up the talk that she is giving early on, then I think the Illini women will be a force to be reckoned with in the Big Ten this season. Later on this fall I will devote an entire blog to covering the women and their outlook for the upcoming season. Homecoming, a tradition that started on the Illinois campus many years ago, begins in earnest this week, with the Big Ten Network's Friday Night Tailgate show originating from the soccer complex, ahead of the Illini's senior night match against Indiana. The Illini are 8-4-1 on the season, and are coming off three straight shutouts, with a 0-0 tie also mixed in there. Seniors Ella Masar and Lindsey Carstens will be playing their final match at home, along with 4 other seniors. Finally this week, the loss to Iowa pretty much derailed any chance of ESPN's College Gameday coming to campus, but with the big matchup on tap against Michigan, ESPN Radio's Game Day will be on hand for most of the day, setting up a makeshift studio near the Assembly Hall. They will be covering the day in college football from Champaign-Urbana, getting everyone ready for the Illini-Wolverines tilt. Yes, it will be a busy weekend on campus, and hopefully, one that many many will be talking about for months to come. The times, they are a changin'. At least, it seems that way for Ron Zook and the Fighting Illini football team, who saw their stock take a meteoric rise on Saturday, with an impressive 31-26 wn over the fifth ranked team in the country, the Wisconsin Badgers. The win marked the second consecutive week that the Illini beat a top 25 team, and that should certainly get them in the Top 25 this coming week, a place they haven't been since the Sugar Bowl season of 2oo1. But what has come about to bring this success, you ask? Personally, I think it has been a lot of patience for Coach Zook, who has endured a tumultuous first two seasons as Illini head coach, but the win over the Badgers gives the Illini a 5-1 overall record, and 3-0 in the Big Ten. They seem to have a leg up on the league now, as they stand near the top of the standings. In talking to some of the players after the game, they seem very excited about what is happening in Champaign, and believe that the nation will begin to take notice after they see what the Illini did to the Badgers. Of course, this is exactly what Zook has been talking about, but he knows that they are not there yet, but after a convincing win against a top 5 opponent, you have to think that they are getting close. So, let's take a look at the numbers from the game, shall we? Rashard Mendenhall continued to set the pace by carrying the ball 19 times for 160 yards and a pair of touchdowns. Mendenhall also caught a touchdown pass from Juice Williams, who ended up leaving the game late in the fourth quarter with an apparent hyperextended knee. Enter Eddie McGee into the game, and he made an immediate impact by scampering 5 yards for the game clinching score. Juice didn't have a bad game, completing 12 of 19 passes for 121 yards and the touchdown to Mendenhall, but he also rushed for 92 yards on 14 carries. Williams doesn't need to always have a good day through the air, because as he has shown time and time again, he runs the option very well and can run for quite a bit of yards. But the fact that McGee can come in and not miss a beat says a lot about his versatility. Offensive lineman Ryan McDonald told me that it really doesn't matter who is behind center, because either of the two players can make it happen. When asked if he was ever a relief pitcher in high school, McGee kind of laughed that comment off. It is an added bonus to have someone that can come in to a ballgame like McGee can, and if given the chance to play an entire game, I believe that Eddie could get the job done. He is taller than Juice, and therefore, can see over the line a little better and make the decisions if he sees routes or pockets open. Aurrelious Benn only caught 5 balls for 51 yards, and he left the game with an injury as well, apparently re-aggravating the shoulder injury that he sustained at Camp Rantoul earlier in the fall. Still, it is very comforting to see the renewed excitement by not only the players, but the fans as well. In a season that is marred by stadium construction, the Illini are once again back in contention for a Big Ten title. So what does this all mean, you ask? With the Illini win on Saturday, they are tied with Ohio State at 3-0 atop the conference standings, with Michigan, who stepped out of conference to take on battle Eastern Michigan, lurking one-half game back at 2-0. The Illini take to the road again next week when they travel to Iowa City to battle the Hawkeyes, who were defeated by Penn State on Saturday 27-7. A road win next Saturday would go a long way and also set up a potential showdown with Michigan in two weeks, in prime time. But everything is still not okay, especially the punting game. Yes, Anthony Santella is better than Kyle Yelton, but he shanked one against the Badgers that could have ended up much worse than it did. Santella did get a few booming punts, but consistency needs to occur if the Illini wish to keep this winning streak alive. Yes, times are much better for the Illini these days, but it can still get a whole lot better. Just ask Ron Zook; he'll tell ya! So what do you think of the Illini's success thus far this season? Surprised? Let me know what you think!